There being 17 of 33 voting members in attendance, a quorum was present. Minutes of the October 6th meeting were presented by Secretary Dan Parker. Mike Wenta motioned to approve the minutes as presented. Gary Friend seconded the motion. The motion passed unanimously. The year-end financial report was presented by Jeff Plasterer in the absence of the treasurer. After discussion, Gary Friend made a motion to approve the report as presented. Scott Bevington seconded and the motion was passed unanimously. Dr. Michael Wilcox from Purdue University’s Center for Regional Development was present to review the status of the Region’s SET Plan. A brief presentation was followed by a question and answer session. Dr. Wilcox then made a presentation concerning a proposal for completion of a Housing Study for the Region at a cost of approximately $25,000. After discussion, the board expressed support for the Executive Committee’s decision to allow the Director to begin fundraising to pay for the study. Plasterer will keep the Board updated on his progress. Mike Wickersham presented the By-Laws which had been presented at the October Board meeting but which failed to pass for lack of a quorum. With a quorum in place at this meeting, the By-Laws were reintroduced. A motion was made for their adoption by Mike Wenta with a second by Leota King. The By-Laws were approved unanimously. The 2017 Budget was shared by Mike Wickersham. Its approval had been recommended by the Executive Committee at its December teleconference. After lengthy discussion, Mike Wenta made a motion to approve the 2017 Budget as presented. Terry Craig seconded the motion. The motion was approved unanimously. Jeff Plasterer gave the Director’s report. Since the last meeting, he has spent most of his time in finalizing the draft of the SET Plan which was initially submitted to the USDA on November 29th. He also completed the required coursework to become certified as a CDBG Grant Administrator. He has met with County Commissioners from Randolph, Rush, Union, and Wayne Counties to discuss EIRPC’s progress. He will meet with Fayette County Commissioners on February 7th. A proposal by the Executive Committee for the Board Meetings to be held quarterly on the third Thursday of April, July, and October from 11:30 to 1:00 was adopted by acclimation. It was further decided that the next two board meetings will be held in Liberty and Rushville completing the rotation of meetings among the five counties. Beginning with the meeting in October of 2017, the Board Meetings will all be held at the County Administration Building in Wayne County. Susie Ripley, Community Liaison from OCRA, joined the board to discuss changes at her agency. The staff of OCRA will work to make the agency more responsive to the communities it serves. Ripley then asked board members to work with her on responding to survey questions. After several questions and comments during a roundtable discussion, Gary Friend made a motion to adjourn the meeting. Kevin Slick seconded the motion which passed unanimously. The meeting was adjourned at approximately 1:10 P.M.
Members Present: Sen. Jeff Raatz; Fayette County: Dan Parker, Dr. Bill Nesbitt; Randolph County: Michael Wickersham, Gary Friend, Kevin Slick; Rush County: Carole Yeend; Union County: Melissa Browning, J. T. Benitez; Wayne County: Ken Paust, Robert Chamness, Nancy Green, Karen Pipes, Steven Sorah, Jesse Berger, Terry Craig. 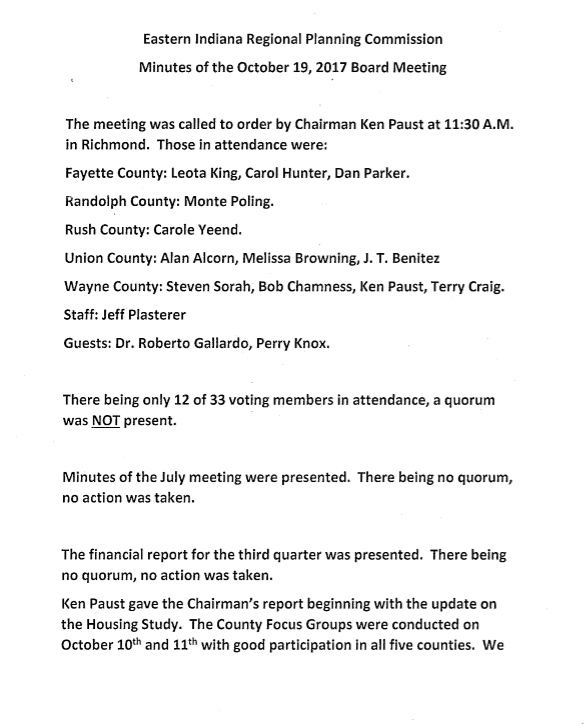 The meeting was called to order at 11:30 A.M. by Chairman Ken Paust. Roll was called and fifteen voting members were present out of the thirty-three voting members on the Board. A quorum requires the participation of 17 members. Since the By-laws allow for electronic consent to actions taken at Board meetings without a quorum of board members present, the minutes will be sent out when prepared with a request for those board members who were absent to vote by return email. The minutes of the June 30th Board meeting were presented. Nancy Green made a motion to approve the minutes as presented. The motion was seconded by Steve Sorah. Fifteen members voted in favor of the motion with 17 votes needed to pass. The minutes of the July 28th and August 23rd Executive Committee teleconference were presented. Terry Craig made a motion to approve the minutes as presented which was seconded by Bill Nesbitt. Fifteen members voted in favor of the motion with 17 votes needed to pass. The financial report for July through September was presented. The By-laws were presented. After pointing out that the By-laws allow for electronic voting in the absence of a quorum, Mike Wickersham made a motion to adopt the proposed By-laws and to send a request for a vote on the minutes and By-laws to all members not in attendance at this meeting. Nancy Green seconded that motion. Fifteen members voted in favor of the motion with 17 votes needed for adoption. The draft of the SET plan was reviewed by Plasterer with a request that members review the document in detail and contact him with suggestions for changes or additions/deletions. A brief discussion yielded comments that schools should be considered an integral part of Quality of Place and that Chambers of Commerce may not be the best choice for inclusion as the “responsible party” in all circumstances. Plasterer explained that the “responsible parties” would all need to be discussed as the SET committee selected them without prior discussion with the entities. Plasterer explained to the group that he has received two quotes to provide design and construction of a web-site for the EIRPC. The purchasing policy established by the executive committee requires three quotes for expenditures exceeding $500. The board was asked for suggestions of companies that might bid on the project. Karen Pipes suggested that Web Canopy Design of Centerville should be solicited for a bid. 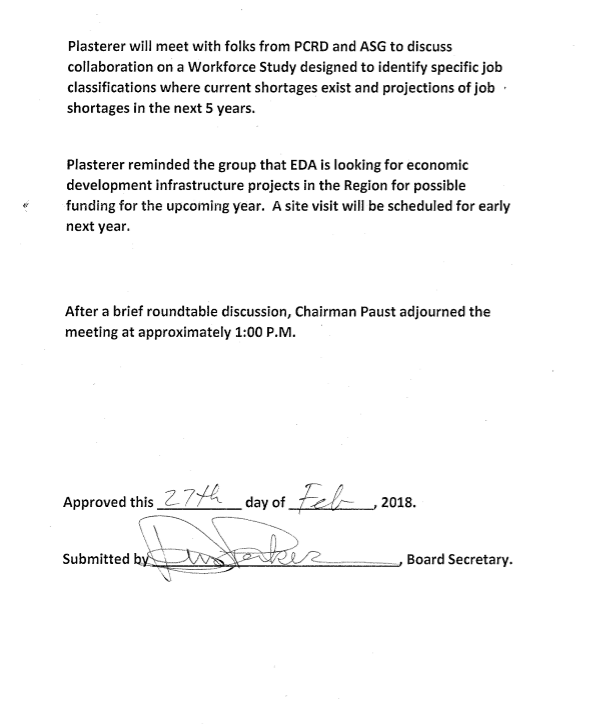 There being no further business, the meeting was adjourned by Chairman Paust at approximately 1:00 P.M. The meeting was called to order at 11:37 A.M. by Governor Pence’s representative, Danny Lopez. He gave a brief welcome to those attending. Fayette County: Dan Parker, Mike Wenta, Gary Keener, Scott Bevington. Randolph County: Mike Wickersham, Missy Williams, Monte Poling, Kevin Slick. Rush County: Paul Wilkinson, Janet Kile, Carole Yeend, Mike Pavey. Union County: Alan Alcorn, Burke Thomas, J.T. Benitez, Jack Heeter. Wayne County: Ken Paust, Robert Coddington, Nancy Green, Steven Sorah, Terry Craig. Twenty-Two of 31 board members were present. Just under 71% of current board members. Lopez asked for nominations from the floor. None were offered so Lopez closed nominations. A motion was made by Mike Wenta of Fayette County, seconded by Burke Thomas of Union County to accept the nominees by acclimation. Motion carried unanimously. Lopez then turned over the chairmanship of the meeting to Ken Paust. Paust congratulated the group on the launch of the new Regional Planning Commission and thanked them for agreeing to serve on the board. He went on to explain that Jeff Plasterer had been working as the Interim Director as an employee of the Southeastern Indiana Regional Planning Commission since December of 2015. Having launched the new organization and established a board of directors, one of the new board’s responsibilities is to hire an Executive Director. 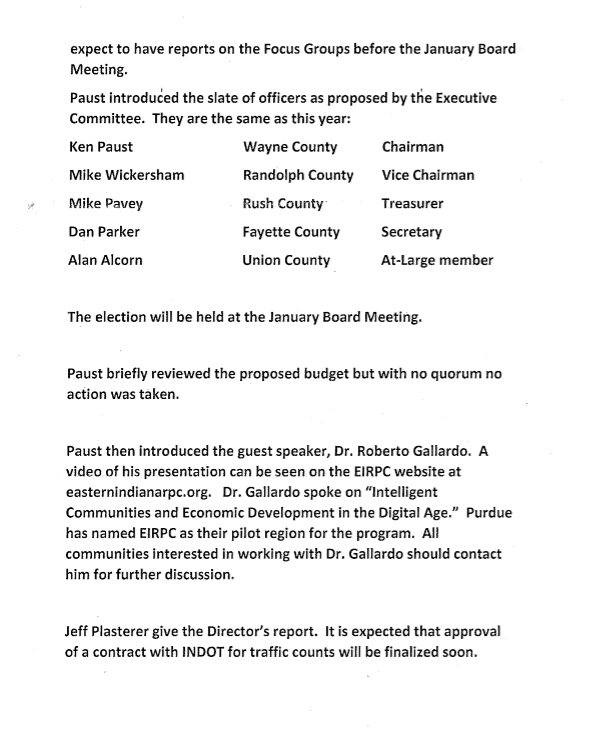 Paust passed on a recommendation from the Executive Committee that Plasterer should be retained as the Executive Director of the Eastern Indiana Regional Planning Commission on a part-time basis of 80 hours per month to be paid a total of $12,000 for the 6-month period of July through December, 2016. The executive committee will make a recommendation of future compensation for 2017 in their budget proposal for next year. A motion was made by Alan Alcorn of Union County, seconded by Bob Coddington of Wayne County, to hire Plasterer to fill the position. Plasterer briefly reviewed the Mission Statement and By-laws with board members. Each member present has a copy in their packet. The board was asked to review the documents and bring any questions to the next quarterly meeting. If there are no changes recommended, a vote to approve the mission and bylaws will be taken in September. The proposed 6-month budget for July to December, 2016 was reviewed. As of June 30th, all but two counties have paid their dues for 2016. (As of July 11th, all five counties are paid in full for 2016.) Total dues revenue for 2016 is $28,132.20. An update was given on the Stronger Economies Together (SET) planning process. Draft Goals were shared with the board as well as the underlying data that led to the choice of those goals. If all goes well, a draft of the entire plan should be ready for discussion at the September meeting. Guest speakers included Susan Craig from SIRPC, Theresa Hartwig from IARC, Rochelle Owen from Rural Development, and Susie Ripley from OCRA. All expressed their enthusiasm and support for the Eastern Indiana Regional Planning Commission and described the services and programs available to the Region and to its members. After a brief roundtable discussion led by Chairman Paust, the meeting was adjourned at 1:07 P.M.